My Birthdays at Kirby’s: Filet Mignon for Everyone! I grew up in the Lower Greenville area, and since we had a nice steakhouse just a couple of blocks away, that’s where we always went for family birthdays and special occasions: Kirby’s. I had forgotten about the birthday cards they sent out until my mother came across one in a recent move which was addressed to “Miss Paula Bosse.” Other than receiving actual mail, the thing that made these cards really exciting for a child was the inclusion of a dime. I always thought of it as a little birthday treat, but my mother suggested it was more of a subtle reminder to the parents to spend that dime on a call for reservations. I loved that place. It was very dark. My brother and I always had the same thing: a non-alcoholic, super-sweet Shirley Temple from the bar, a salad with big chunks of roquefort in the salad dressing, a baked potato, and, oh my god, a filet mignon. I was mesmerized by the bacon wrapped around the steak. And the little wooden marker that showed how the meat was cooked. It was a nice, friendly neighborhood steakhouse. It was loud and happy. You could hear the steaks sizzling on the grill. It was always a treat to go to Kirby’s. And the place smelled GREAT! Even out on the sidewalk. I was sad when they tore the building down, and even though there is now a chain of restaurants with the name “Kirby’s” — they even built a new one a couple of blocks down from the original location — there’s no way it could ever be the same. Looking around for the history of the original “Kirby’s Charcoal Steaks,” I was surprised to discover that the man who owned Kirby’s — B. J. Kirby — was the son of the man who founded the Pig Stand chain of drive-ins. The Pig Stand started in Dallas, and it was the first drive-in restaurant EVER. They had the first carhops. The first onion rings. The first Texas toast. The Kirby’s steakhouse location — 3715 Greenville — had actually been a Pig Stand! B. J. Kirby had grown up working at his father’s restaurants, and when his father died, he sold all the Pig Stands except for the Greenville Avenue location (i.e. Pig Stand No. 4). In 1954 he turned the pig-sandwich-serving drive-in into a nice sit-down steakhouse which remained popular until the restaurant closed in 1987 when Mr. Kirby retired. Watch Ch. 5 news footage of B. J. Kirby and the auction of the restaurant fixtures at UNT’s Portal to Texas History site, here. I could really go for a bacon-wrapped filet mignon right about now. And one of those Shirley Temples would even hit the spot. “Something to Crow About!” card from the author’s collection. Color photo of the Kirby’s sign is a screenshot from the Channel 5 news coverage of the auction of the Kirby’s fixtures, which aired April 14, 1987, viewable here; from the KXAS-NBC 5 News Collection, UNT Libraries, via the Portal to Texas History. First ad from 1958; bottom ad from 1951. An entertaining history of the Pig Stand No. 4 and its transformation into Kirby’s Charcoal Steaks can be found here. I also lived nearby and as a teen could and did walk to both the Arcadia and Granada theaters. 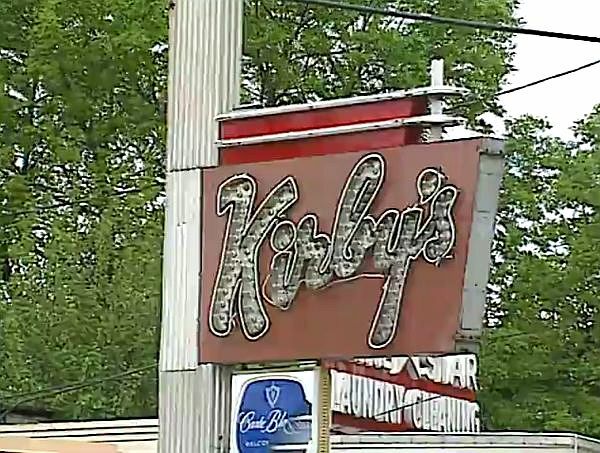 I enjoyed almost weekly trips to Kirby’s from late 60’s until they closed, especially every special occasion. Tried the replacements a couple of times and the one in Plano was better than the Greenville version but it closed. The new Greenville version was very much like the original at first but it has changed way too much for me to visit again. I have to admit I’ve never tried the new incarnations. They have almost no connection to the original restaurant, and there’s no way they could (…or WOULD) duplicate Kirby’s funky/cool atmosphere. I should have appreciated it more when it was here!